Silicon Valley S5 E2: "Reorientation" review – AiPT! Two episodes into the new season and we’re two for two. Richard’s greatest weaknesses and his greatest strengths are on display in this week’s episode as Pied Piper’s CEO now has the daunting task of dealing with the two new staffs he acquired from Sliceline and Optimoji. While his kill-two-birds-with-one-stone play involving the mass ordering of more pizzas than Sliceline could possibly fulfill was quite ingenious, Richard is decidedly less impressive in the follow-through. And that’s because, despite his title, Richard isn’t actually a good leader. He lacks the fundamental people skills and outward confidence required to gain the trust and loyalty of strangers. To rub it in further, Gilfoyle steals Dinesh’s superior parking space with it, which goads Dinesh into a race for the space that ends in the Tesla getting into an accident and Dinesh having to pay for repairs he can’t afford. But Dinesh isn’t the only one with bills they can’t afford. In Jian Yang’s efforts to prove Erlich is dead so he can then pass off a fraudulent will bequeathing Erlich’s house and incubator to him, Jian Yang is passing off cremated pig ashes as his former rival’s remains. If he can prove Erlich’s dead, he can take ownership of his 10% stake in Pied Piper as well. Unfortunately, Jian Yang didn’t do his homework and has made no effort to look into any next of kin. And he must first settle all claims against the estate and pay all Erlich’s outstanding bills. Because Erlich was not a particularly responsible person, Jian Yang realizes he may have just inherited all of Erlich’s debt. Gavin Belson’s got smaller problems. His new Signature Box doesn’t have his real signature on it because his signature looks bad. A handwriting expert says Gavin’s signature suggests he’s a sociopath, so Hooli’s CEO holds a competition to have employees try to make the best signature. The one ultimately elected — or erected — the winner has a rather silly and inevitably embarrassing flaw that goes completely under Gavin’s radar. Richard’s in no better shape though while Pied Piper’s offices remain firmly divided between “Sliceline guys” and “Optimoji guys.” The two teams are doing good work but their lack of cohesion is causing serious setbacks. Each team also has their own culture that doesn’t mesh well with that of the other team. And because the Sliceline guys know they were only acquired as a means of recruiting the Optimoji guys, that too is a source of tension. Richard briefly thinks he’s smoothed the waters by agreeing to Sliceline’s demand to allow them to bring their dogs to work. But now Pied Piper is full of dogs, which brings a whole slew of new problems. Richard can’t win, and the two teams are now united, but united against him. Much like Richard’s first flash of brilliance that won TechCrunch in the Season 1 finale, he once more becomes the crazed lone coder grabbing success from the jaws of total defeat one keystroke at a time. Word gets out, and it’s such a spectacle to behold that all the Sliceline and Optimoji teams come back to watch Richard single-handedly doing the work that would have taken both teams four days in a fraction of that time. This makes believers of the new staff and unifies Pied Piper. This was another strong episode. Silicon Valley always knows how to take Richard out of his comfort zone and force him to find his own way to rise above his obstacles. And, while it’s always fun to watch Pied Piper’s CEO fall on his face, every once and awhile it’s nice to see him be truly extraordinary to remind us why we should root for him in the first place. For so long, Pied Piper was just a couple of nerds living and working out of Erlich’s house. Now it truly feels bigger than that. Richard now commands, and is responsible for, dozens of employees, most of whom haven’t been his long-time friends. And that opens up whole new doors of story possibilities, as does the presence of a Hooli spy in their midsts. Jian Yang’s increased role this season feels like a nice change of pace in this post-Erlich era. And Gavin’s storyline was so perfectly Gavin. My only real nitpick with the episode is that Dinesh And Gilfoyle feel kind of useless to the company lately. While the entire rest of the staff walked off, Dinesh and Gilfoyle contributed nothing in their absence. The show certainly gives them their moments like Gilfoyle hacking the smart fridges last season, but two episodes into the new season and we’ve only seen them continuing their sibling rivalry dynamic without actually pulling their weight when it comes to the larger success of Pied Piper. Those characters need to start doing something. 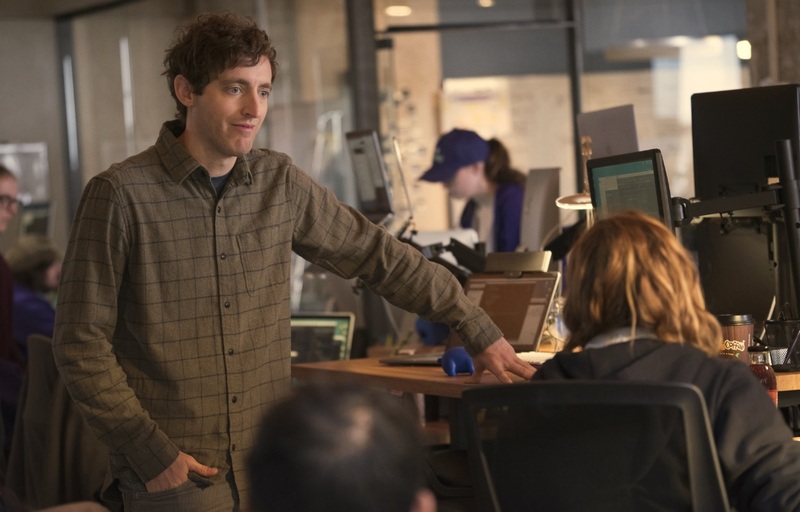 Silicon Valley S5 E2: "Reorientation"
Two episodes into the new season and we're two for two.